A new generation of hydraulic modeling tools can help engineers design and build safer, more resilient transportation infrastructure and deliver projects involving waterways more efficiently than modeling techniques developed 60 years ago. Traditional one-dimensional (1D) modeling techniques used for hydraulic design apply several assumptions that can lead to overly conservative or inaccurate results. Next-generation hydraulic engineering tools—particularly 2D modeling and graphical visualization features—allow users to create better representations of the often-complex interactions among waterways, the transportation infrastructure, and the surrounding environment. These modern tools represent a significant evolution in hydraulic modeling theory and practice, with potential for streamlining environmental, regulatory, engineering, and other aspects of project delivery. The tools can improve the ability of transportation agencies to design safer, more cost-effective, and resilient structures on waterways. 3D graphical visualizations derived from 2D modeling offer hydraulic engineers better ways to communicate and collaborate with project stakeholders, including other transportation professionals, resource agencies, and the public. The EDC-4 effort on CHANGE is generating widespread interest among States. Twenty-eight States, Washington, DC, Federal Lands Highway, and the U.S. Virgin Islands plan to demonstrate and assess hydraulic engineering tools in 2017 and 2018. Another 15 States plan to institutionalize hydraulic tools. using 2D modeling about 3 years ago on a bridge repair project to better understand the hydraulic conditions that caused the bridge to fail because of scour, the erosion of riverbed material around bridge foundations. Since then, MDT has expanded the use of 2D hydraulic modeling to most of its bridge projects and obtained FHWA training for the agency’s entire hydraulic design staff and consultants. “It has changed how we attack our hydraulic designs. It’s making us more efficient and getting us a more accurate assessment of what’s going on hydraulically,” said J.R. Taylor, MDT hydraulic engineer. Another benefit MDT hydraulic engineers noted is improved communication with other project stakeholders. After taking 2D hydraulic modeling training from FHWA’s National Highway Institute, the Georgia Department of Transportation completed 2D modeling on several bridge projects. 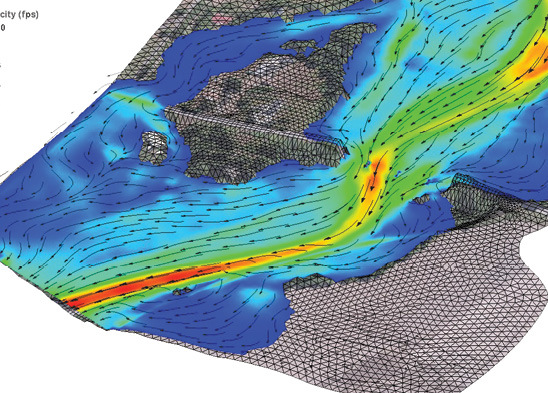 The agency found that using 2D hydraulic modeling provided more accurate visualization of water surface elevations and flow distributions through multiple bridge openings. 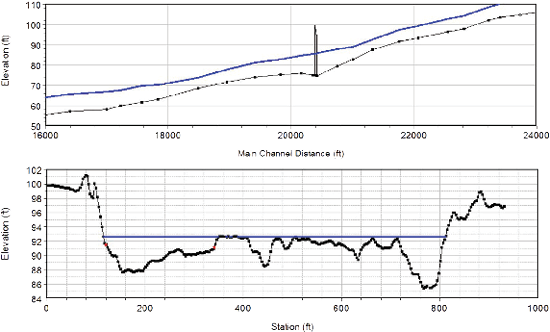 The Alaska Department of Transportation and Public Facilities developed a 2D hydraulic modeling review guidance document with the University of Alaska Fairbanks. 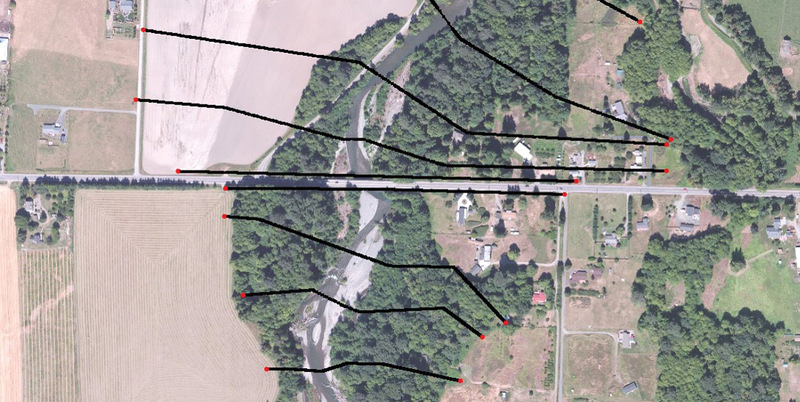 The agency developed a 2D model for the Chilkat River for a road project. The model was used to verify the proposed locations of bank protection and habitat enhancement features. Watch the EDC-4 summit session on collaborative hydraulics for an overview of how States are using the innovation to improve project design and delivery. 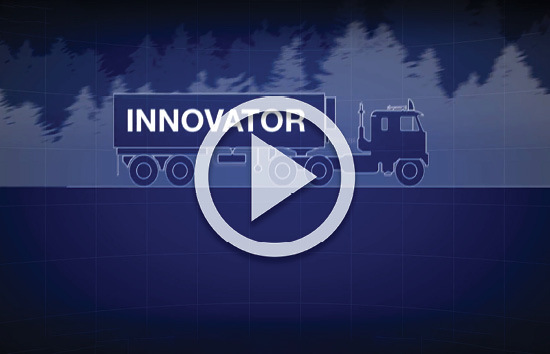 View a series of on-demand videos on collaborative hydraulics. See FHWA’s hydraulic engineering web page for information on guidance, research, software, and training. Contact Scott Hogan of the FHWA Resource Center for information, technical assistance, and training on collaborative hydraulics. State Transportation Innovation Councils (STICs) use a variety of approaches to select, deploy, and communicate about innovations. Sharing these approaches and learning what others are doing are at the heart of the national STIC network. Effective STICs are well organized with defined processes for identifying potential innovations from sources such as Every Day Counts, the second Strategic Highway Research Program, and the American Association of State Highway and Transportation Officials Innovation Initiative. They also have broad stakeholder involvement, shared performance metrics, and engaged leadership. Consider these best practices of successful STICs from a recent FHWA publication, which includes State examples and contacts for more information. Appoint an innovation engineer. A dedicated champion who oversees innovation deployment can serve as a central contact and shepherd innovations from the idea stage through implementation. Form innovation subcommittees. In addition to evaluating potential innovations, they will leverage various points of view and connect project development and delivery with the research community, industry, and field practitioners. Bring the research community on board. Including transportation agency research staff on your STIC will strengthen the link between innovation research and implementation. Adding representatives from academia will guide researchers in supporting future innovations. Include the Local Technical Assistance Program center. The center can help provide training and outreach to local agencies. It can share technical information and reports and produce State-specific job aids and newsletter articles on innovations. Organize innovation events. Public events designed to share information about innovations can help build relationships among stakeholders, increasing collaboration and support. Set up a STIC website. Use an online presence to communicate about STIC activities, innovation deployment, and lessons learned—both successes and failures. Live stream STIC meetings. Draw in more participants to increase input from stakeholders throughout the State. Further expand your audience by posting recorded meetings online for on-demand viewing. Enlist social media. Use social media platforms to communicate with stakeholders about innovation deployment and projects that use new technologies and practices. Engage the public and decision makers with facts on lives, time, and money saved. Include your communication team. Your agency’s communication professionals can use tools and resources already in place to tell the compelling story of your innovative efforts and share results with key audiences. Use change management tools and techniques. Nurture a culture of innovation by publicizing innovation efforts, embedding innovation in State transportation goals, and engaging leadership at all levels. Contact Sara Lowry of the Federal Highway Administration Center for Accelerating Innovation to share STIC success stories. State Transportation Innovation Councils (STICs) in Pennsylvania and Wisconsin received the 2017 STIC Excellence Awards for their success in fostering a strong culture of innovation among stakeholders. The American Association of State Highway and Transportation Officials and Federal Highway Administration sponsor the annual award to promote innovation nationwide. FHWA Acting Administrator Brandye Hendrickson presented the 2017 awards at the AASHTO Board of Directors meeting in Phoenix, AZ, in September. 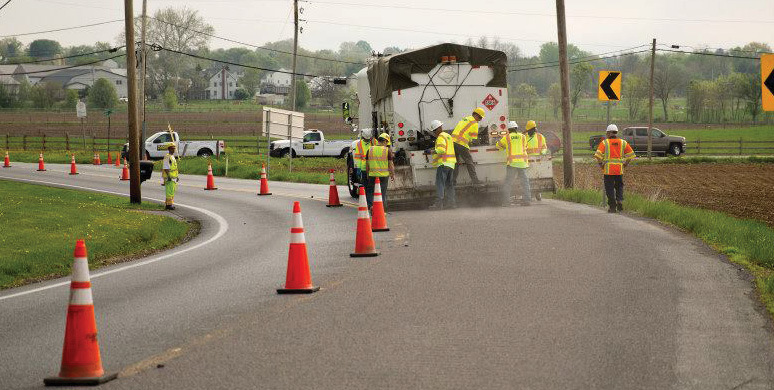 The Pennsylvania STIC conducted a demonstration in Lebanon County to promote the benefits of using high-friction surface treatment on local roads. The Pennsylvania STIC has enriched dialogue between State and local transportation leaders and promoted state-of-the-art safety practices and resources, Hendrickson noted in presenting the award to Pennsylvania Department of Transportation Secretary Leslie Richards. The STIC “has fostered a culture of innovation that continues to grow,” Hendrickson said. The Pennsylvania STIC and local governments collaborated on a Salt and Snow Management Course that trained 600 participants on innovative winter maintenance techniques. 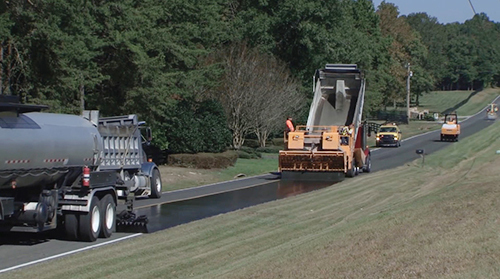 Another collaboration featured a high-friction surface treatment demonstration that enabled nearly two dozen local governments to learn how to install this road safety countermeasure. The Pennsylvania STIC also collected feedback from 445 local agencies to understand their top transportation issues, held a Local Government Innovation Day, and simulcast a Local Government Safety Seminar. The Wisconsin STIC created a multitiered organizational structure that enabled the State to deploy more than 40 Every Day Counts innovations, seven second Strategic Highway Research Program solutions, and numerous innovations identified by transportation stakeholders. Wisconsin’s Local Innovation Teams include on-the-ground practitioners who apply innovations on projects and propose ideas. The Innovation Review Committee is a multidisciplinary team of champions who collaborate on innovations and identify paths for rapid deployment. The Wisconsin STIC also provides a partnership to facilitate innovative ideas from its external members. “This State’s combination of internal-external and a top down-bottom up approach made its culture of innovation strong and provided a formal structure to make sure innovations would work and could be rapidly implemented,” said Hendrickson, who presented the award to Wisconsin Department of Transportation Secretary Dave Ross. Both e-Construction and construction partnering help agencies improve the delivery of transportation projects. Using the two practices together offers even greater opportunities to manage projects effectively and efficiently. In Every Day Counts round four (EDC-4), the Federal Highway Administration is promoting e-Construction and Partnering: A Vision for the Future, which involves using paperless technologies to enhance partnering among project stakeholders, improving communication and workflows while streamlining project delivery. “There’s a synergy between e-Construction and partnering. When you want to have good partnering, you have to have good processes and collaboration and transparent workflows,” said John Haynes, FHWA Research and Innovation Program manager. e-Construction, also an EDC-3 innovation, is the creation, review, approval, distribution, and storage of construction documents in a digital environment. It replaces paper with electronic processes that improve workflows, increase transparency, enhance safety and quality, and save time and money. Construction partnering is a project management practice in which transportation agencies, contractors, and other stakeholders create a team relationship of mutual trust and enhanced communication. Partnering builds connections among stakeholders to complete quality projects that are finished on time and within budget, focused on safety, and profitable for contractors. 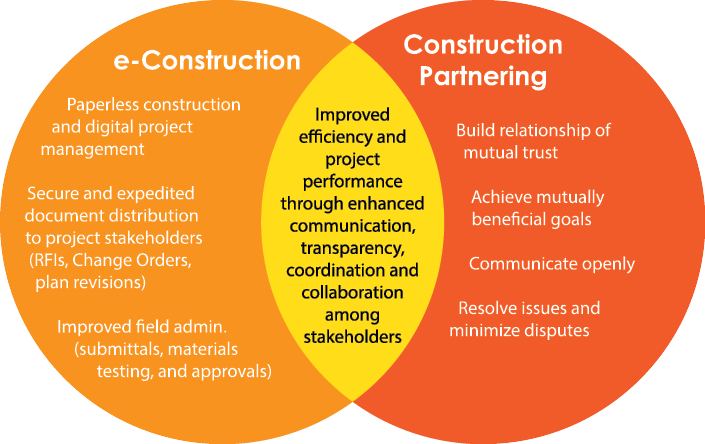 Integrating e-Construction and construction partnering creates synergies. “It’s a way of becoming more efficient with your dollars and your time, which we all know is limited for most States,” said Bernie Kuta, FHWA Resource Center team leader. 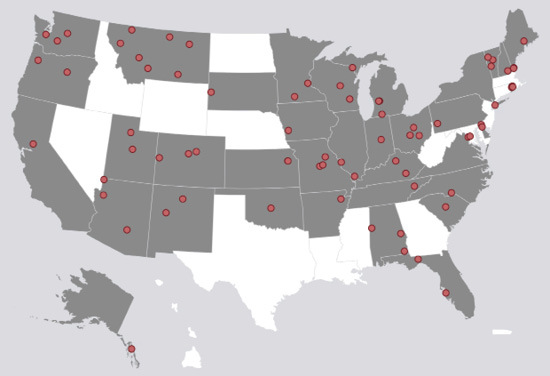 In EDC-4, 25 States, Washington, DC, the U.S. Virgin Islands, and Federal Lands Highway (FLH) plan to demonstrate and assess e-Construction tools and processes. Another 21 States expect to make e-Construction a standard practice. Ten States, the U.S. Virgin Islands, and FLH plan to demonstrate and assess paperless technologies to improve partnering among stakeholders on construction projects in EDC-4. Another 17 States plan to make e-Construction and partnering a standard practice in project delivery. The California Department of Transportation (Caltrans) is among the agencies that are combining e-Construction and partnering to improve project delivery. Caltrans has a formal construction partnering program with a guidebook on partnering facilitation. The agency is piloting tablet devices in the field as a way to reduce support costs by having plans and other documentation readily accessible to project team members. The Florida Department of Transportation (FDOT) institutionalized the use of a customized software platform for project collaboration, tablets for field data collection, and formal partnering on some contracts. FDOT developed an e-Construction How-To Guide as an aid for other State agencies that are implementing construction management technologies. The Ohio Department of Transportation (ODOT), which has a Construction Partnering program, requires a formal partnering process on every project. ODOT is implementing the use of mobile technology for reporting, inspecting, and documenting the progress of projects. ODOT converted inspection forms to electronic format, distributed an app to replace daily work report entry, and adopted digital signatures for change order documents. Watch the EDC-4 summit session on e-Construction and partnering. See FHWA’s e-Construction web page for a resource library, videos, and webinar recordings. Read Addressing Challenges and Return on Investment for Paperless Project Delivery (e-Construction) for guidelines for implementing e-Construction and a framework for calculating return on investment. For information and technical assistance on e-Construction, contact Kathryn Weisner of the FHWA Resource Center. For information and technical assistance on construction partnering, contact Chris Schneider or Richard Duval of the FHWA Office of Infrastructure. Halfway through Every Day Counts round four (EDC-4), the transportation community continues to experience the positive impacts of earlier EDC rounds inspiring adoption of proven innovations to shorten project delivery, enhance safety and mobility, and improve quality. Many of the 11 innovations the Federal Highway Administration promoted in EDC-3 are now widely used across the country. The following are examples from a recent FHWA publication that highlights successful innovation deployment during the 2-year cycle. Florida is among the States that pursued e-Construction—the collection, review, approval, and distribution of construction documents in a paperless environment—in EDC-3. Since July 2016, the Florida Department of Transportation has used e-Construction for all construction contracts to provide instantaneous data collection and resolve issues in the field. The agency estimates a $1.1 million investment saved $22 million a year in reduced administrative processing time. View “Mission: Possible” video on Every Day Counts round four. Geosynthetic reinforced soil–integrated bridge system (GRS-IBS) technology is helping States like Rhode Island meet the demand for small bridges by delivering low-cost, durable structures that can be constructed with readily available equipment and materials. The Rhode Island Department of Transportation combined the use of GRS-IBS abutments and a bridge move to accelerate replacement of the East Shore Expressway and McCormick Quarry Bridges in East Providence. Using these innovations cut the closure times for each bridge from 1 year to 80 hours. The Missouri Department of Transportation (MoDOT) is using data-driven safety analysis to integrate safety performance into highway investment decisions with the goal of saving lives. MoDOT used safety analysis to identify that two-thirds of severe crashes occurred on roads carrying 400 to 1,000 in average daily traffic (ADT)—routes that typically did not have edge line striping. After the agency painted edge lines on all 7,500 miles of roads in this ADT range, crashes dropped 15 percent. Many States and localities use the road diet, a low-cost strategy to reconfigure a roadway cross section to safely accommodate all users, increase mobility and access, reduce crashes, and improve a community’s quality of life. When Tucson, AZ, installed a road diet on a 2-mile segment of Park Avenue, motor vehicle crashes decreased from an annual average of 95 to 32, a 66 percent reduction. Crashes involving bicyclists or pedestrians fell from an annual average of three to zero. Every Day Counts encourages adoption of proven innovations to improve U.S. transportation infrastructure, including pavement preservation (top) and accelerated bridge construction (bottom). Agencies adopted smarter work zone strategies, including project coordination to minimize work zone impacts and save time and money and technology applications to manage work zone traffic dynamically and enhance safety. The Texas Department of Transportation deployed an end-of-queue warning system as part of a widening effort on I-35 in central Texas. Using the system cut crashes by 44 percent, and the crashes that did occur were less severe because of the reduction in high-speed, rear-end collisions. The system reduced crash costs by $1.36 million during 216 nighttime lane closures. 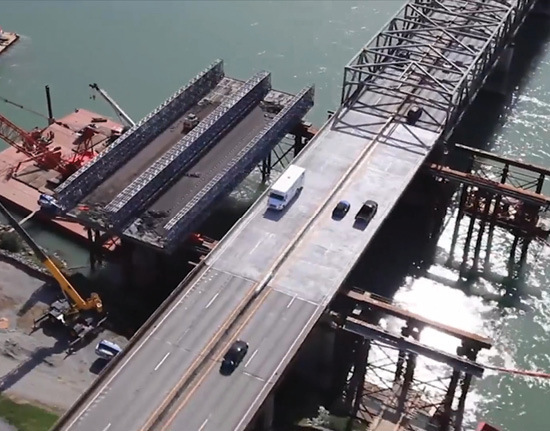 The transportation community is applying 3D engineered models to better connect the design and construction phases on projects and to positively affect safety, costs, maintenance, and asset management on other project phases. The Michigan Department of Transportation and M-1 Rail used 3D modeling on a Detroit project to lower risk, save time, and reduce user delays. Utilities in a main commercial corridor, some dating from the 1890s, were mapped in a 3D model. Modeling reduced the time it took engineers to give direction or find a new path around a utility from 3 days to under an hour, saving about $310,000 on the project. Ultra-high performance concrete (UHPC) is helping the transportation community increase the use of prefabricated bridge elements to accelerate bridge construction. The New York State Department of Transportation replaced bridge decks on four bridges near Syracuse using precast concrete deck panels and field-cast UHPC connections, eliminating the closure time needed for forming, reinforcing steel placement, and curing on conventional concrete decks. The decks on two of the bridges were replaced during a 10-day closure. Seven State and local agencies will use Accelerated Innovation Deployment (AID) Demonstration awards to implement innovations such as e-Construction, ultra-high performance concrete (UHPC), and a diverging diamond interchange (DDI) on transportation projects. Since its launch in 2014, the Federal Highway Administration’s AID Demonstration program has provided nearly $48 million for 69 awards to help Federal, State, local, and tribal agencies accelerate deployment of proven innovations to deliver projects faster, better, and smarter. The Alabama Department of Transportation (ALDOT) received an award to deploy e-Construction technology for mobile project inspections. This demonstration program will allow ALDOT to evaluate the use of tablets, smartphones, or other electronic devices to streamline the project inspection process and enhance real-time communication on projects. The Colorado Department of Transportation (CDOT) will use its award to pilot an e-Construction and mobile-based project delivery system. This innovation is expected to enhance construction management operations, streamline project inspections, and integrate the inspection platform with CDOT’s construction management system. The Delaware Department of Transportation will replace a bridge in Blackbird using accelerated bridge construction. The substructure and superstructure will consist of precast concrete components. 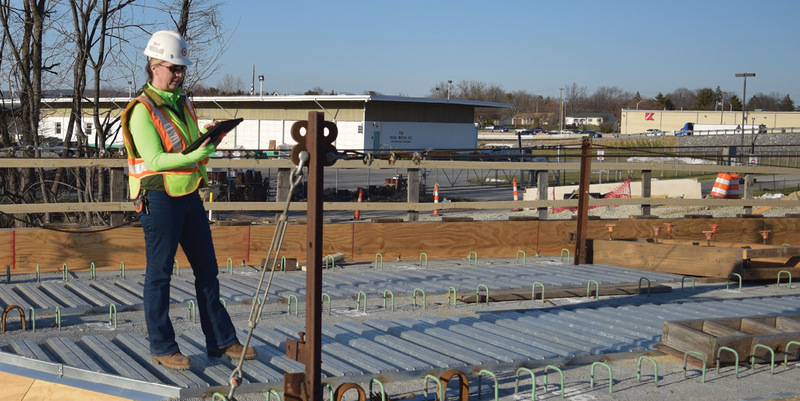 UHPC will be used to connect precast beams and provide a riding surface overlay, showing that UHPC can be used to produce a long-lasting, maintenance-free bridge deck. The Illinois Department of Transportation will use prefabricated deck panels with UHPC connections on a project to reconstruct the Campground Road Bridge over I-57 in Jefferson County. The bridge will have increased load-carrying capacity and will enhance safety by providing a wider roadway and more clearance over the interstate. The Maine Department of Transportation will use its award to construct the State’s first DDI at an I-95 exit in Bangor. The DDI will provide a long-term solution to mitigate mobility, safety, and access issues at the State’s busiest diamond interchange. The Missouri Department of Transportation (MoDOT) and the city of Mexico will reconstruct part of Holt Street with compacted concrete pavement, which provides greater durability and lower life-cycle costs than traditional concrete pavement, and upgrade sidewalks to comply with the Americans With Disabilities Act. The project incorporates solutions promoted in the Every Day Counts initiatives on pavement preservation and safe transportation for every pedestrian. MoDOT will rehabilitate the Big Bend Boulevard Bridge over I-270 in St. Louis County using a new nanocoating product that forms a passive corrosion protection system. Using the innovation will allow MoDOT to accelerate construction, reduce traffic delays, and provide a longer-lasting coating system on the bridge. For information on the AID Demonstration program, contact Fawn Thompson of the FHWA Center for Accelerating Information. Maricopa County, AZ, is taking the lead in the AZTech Regional Partnership to implement automated traffic signal performance measures (ATSPMs) via a central server for 24 cities and towns in the Phoenix metropolitan area. The ATSPM server is part of AZTech’s Regional Archived Data System, a repository of intelligent transportation system data. This deployment approach leverages existing communication infrastructure, minimizing implementation costs and maximizing the availability of the technology for agencies in the region. The Colorado Department of Transportation (CDOT) demonstrated the world’s first self-driving work zone vehicle on a road striping operation in Fort Collins. The demonstration was part of CDOT’s implementation of smarter work zone technologies to enhance work zone safety. The Autonomous Impact Protection Vehicle removes the driver from the truck outfitted with an impact attenuator, or crash cushion, that customarily travels behind mobile work crews acting as a barrier to deflect vehicles that could hit people or equipment. The self-driving technology takes the vehicle driver out of harm’s way while still protecting workers. Louisville, KY, is fostering innovation through the use of hackathons, working sessions focused on generating problem-solving ideas with potential for development. At a July hackathon, city employees analyzed crowd-sourced traffic data from a smartphone application and other data, such as lane closures and traffic counts, and applied them to six transportation-related projects. One project involves creating incentives for increasing bus ridership to reduce traffic congestion. Another project calls for using crowd-sourced alerts on traffic crashes in areas with active cameras to enable police to point cameras at incidents immediately and respond more quickly. The Virginia Department of Transportation (VDOT) is using design-build contracting to deliver the 395 Express Lanes project, which will extend the express lanes on I-95 for 7.7 miles north to the Washington, DC, line. The project will improve the regular travel lanes on I-395 and add a third reversible lane, reducing congestion and enhancing mobility for travelers. The project will extend the benefits of the 95 Express Lanes, giving drivers the option to pay a toll during rush hour for a faster, more predictable trip. VDOT and its design-build partners are minimizing impacts during construction by doing on-road work outside of rush hour periods. Bellevue, WA, installed adaptive signal control technology (ASCT) at the city’s more than 200 intersections over the past 6 years. ASCT uses real-time traffic data to adjust the timing of lights to accommodate changing traffic patterns and ease congestion. In the first year after installation, ASCT reduced delays on NE 8th Avenue by 43 percent near 112th Street and 35 percent on the east side of I-405. ASCT also streamlined left turns in Bellevue, saving 166,000 hours of traffic delays in 2014.